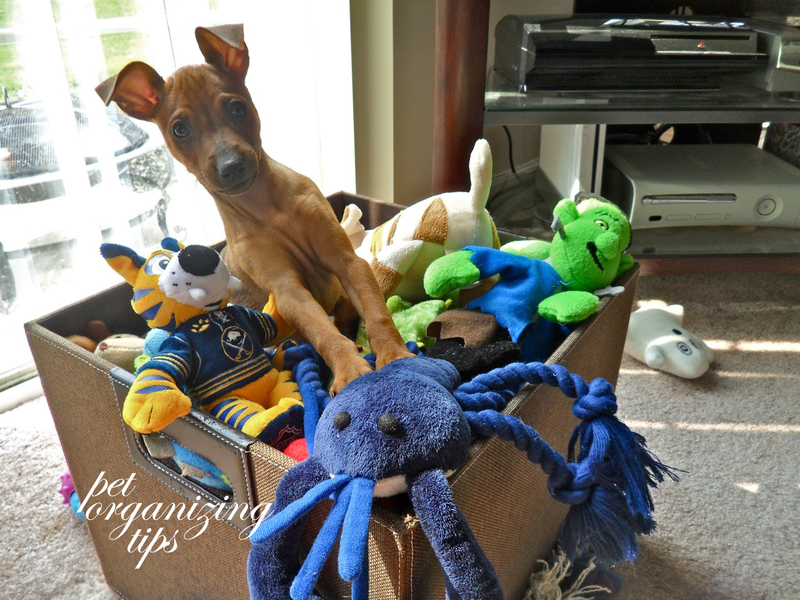 We have two miniature pinschers and I’m always looking for creative ways to keep all of their stuff organized. From their food and treats, to their grooming items, toys and leashes their stuff seemed to take over our downstairs. With a few personal touches I’ve found several ways to not only keep their things out of the way and accessible, but I’ve also found ways to keep it looking nice so it’s not such an eyesore. For their food and treats, I moved the bottom shelves in one of our cupboards up so they could have the bottom half of the cupboard. 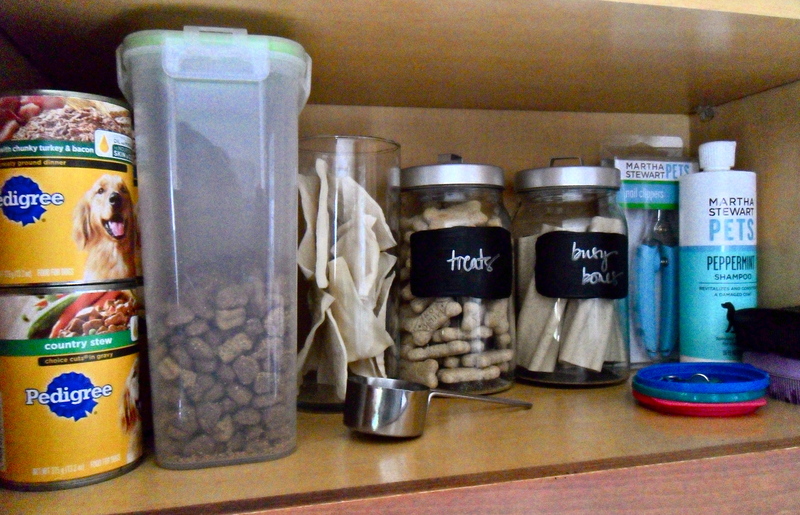 I stack their canned food on one side and put their dry food into a plastic cereal dispenser and keep a stainless steel scoop right next to it. Their rawhides come in huge plastic bags, so I like to keep them in a clear cylindric vase that’s easier to get access to. I got glass jars from Ikea and painted rectangles on them in chalkboard paint. I label them with a silver sharpie and store their treats and busy bones in them. I keep their shampoo, nail clippers and brushes off to the right hand side and plastic lids for their canned food in front of their grooming stuff. I bought a fleece comforter that we use to cover the dogs crate in our family room. This serves two purposes, it blocks the light in the morning so they don’t wake up earlier than necessary and it hides the fact that theres a big ugly crate underneath! The crates butted up against one backside of our sectional so the dogs like to spend a lot of time hanging out on top of the crate during the day. My dad cut a cardboard box into a sheet that covers the crate bars and goes underneath the comforter so they can walk around up there. I keep a bin with their toys on there as well as a leather media box that I use to hold all their sweaters (they’re prone to pneumonia because they’re so small, the sweaters are for function not fashion lol) and I also keep a pillow up there that they like to nap on. 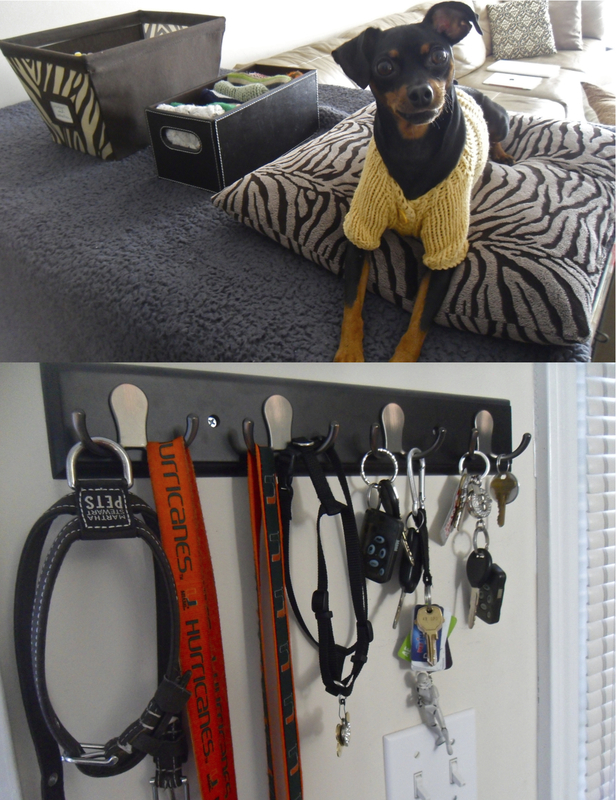 We keep their leashes and harnesses right next to the door on our key hooks. That way they’re easy to grab on the way out and easy to put up when we come back in. Hanging them on the hooks ensures we not only know where they are at all times, but also that they won’t get tangled up! What are some ways you guys organize your pets things?